In 2015–2017 the idea that dense dark matter was composed of primordial black holes, made a comeback following results of gravitation wave measurements which detected the merger of intermediate mass black holes. Black holes with about 30 solar masses are not predicted to form by either stellar collapse (typically less than 15 solar masses) or by the merger of black holes in galactic centers (millions or billions of solar masses). It was proposed that the intermediate mass black holes causing the detected merger formed in the hot dense early phase of the universe due to denser regions collapsing. 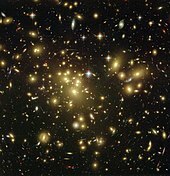 However this was later ruled out by a survey of about a thousand supernova which detected no gravitational lensing events, although about 8 would be expected if intermediate mass primordial black holes accounted for the majority of dark matter. The possibility that atom-sized primordial black holes account for a significant fraction of dark matter was ruled out by measurements of positron and electron fluxes outside the suns heliosphere by the Voyager 1 spacecraft. Tiny black holes are theorized to emit Hawking radiation. However the detected fluxes were too low and did not have the expected energy spectrum suggesting that tiny primordial black holes are not widespread enough to account for dark matter. None-the-less research and theories proposing that dense dark matter account for dark matter continue as of 2018, including approaches to dark matter cooling, and the question remains unsettled. In 2019, the lack of microlensing effects in the observation of Andromeda suggests tiny black holes do not exist. ^ a b Overbye, Dennis (27 December 2016). "Vera Rubin, 88, Dies; Opened Doors in Astronomy, and for Women". The New York Times. Retrieved 27 December 2016. ^ Niikura, Hiroko (1 April 2019). "Microlensing constraints on primordial black holes with Subaru/HSC Andromeda observations". Nature Astronomy. doi:10.1038/s41550-019-0723-1. Retrieved 25 April 2019. 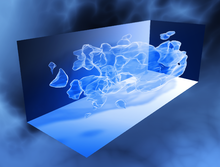 ^ "Verlinde's new theory of gravity passes first test". 16 December 2016.